This week I had what can only be described as a very Swedish experience. 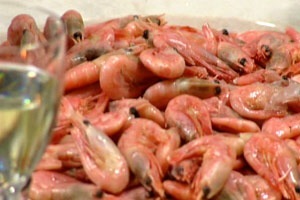 With friends, I participated in a ‘shrimp cruise’, also referred to as a ‘prawn pig out’. It works like this. You board a boat and, as it chugs around the archipelago, you eat as many shrimps as you can stomach. The menu consists of shrimps, aioli, bread. You wash this down with wine, cocktails and beer. Then there’s cheese and coffee. As you peel and pick away, the gastronomical treat is accompanied by a live band playing very loud music of a varied nature – rock, pop, country, Eurovision. I guess it’s to appeal to a wider audience. On this particular prawn pig out, there were about 50 passengers. And they were as eclectic as the music. Young couples, middle-aged couples, former party girls, pensioners and a gang of work colleagues from what seemed to be a construction company. Despite our differences, we all had one thing in common – a love for all-you-can-eat shrimps. I can’t exactly describe this experience as classy. But it was actually fun. And very very Swedish.